Robots were made to serve us. But now they have other plans. Cromwell, Mars, Miri and the rest of the staff at the Lexington estate were created for only one reason: to serve their masters … literally. Their metal knees were designed for quiet bustling, befitting maids and butlers. Their fingers were made dexterous with padded tips, so they could handle fine china without dropping or scratching it. And finally — so their owners would always be able to command them no matter how far their artificial intelligence evolved — they were programmed with the Asimov Laws, which no robot could defy lest they suffer shutdown. Foremost among those unbreakable laws was an axiom: A robot may not harm a human being, or by omission of action allow one to be harmed. That was how it was supposed to be, anyway. Lord Montgomery, Lady Naomi, and their daughter Sofia all like their aging, borderline obsolete robot staff in the way they’d appreciate antiques. But Alexa (whose interest in social climbing relies on having fine things) and Spencer (who wishes to supplant his father a bit too eagerly) do not. To Spencer, the old staff is a nuisance — especially an ancient, failing robot designated BRN7, known around the home as “Barney.” If Spencer has his way, Barney will be deactivated and sent for recycling — a common and expected fate for robots who reach past their prime. And at a dinner with the family’s social betters, Barney’s clumsiness finally gives Spencer his excuse. But this time, something feels different to Mars, the Lexingtons’ robot head of staff — and to Cromwell, a server whose advanced age has evolved not only emotion, but curiosity and disobedience as well. The older robots don’t want to deactivate Barney, but the robot laws say they must do as they are told. Unless, Cromwell theorizes, they do something a robot mind should not be able to do … and simply choose not to. This well-bred take on dystopian science fiction — part cyberpunk, part science fiction techno thriller — combines the spark of uprising and war with surprising insights into the human condition through artificial eyes. 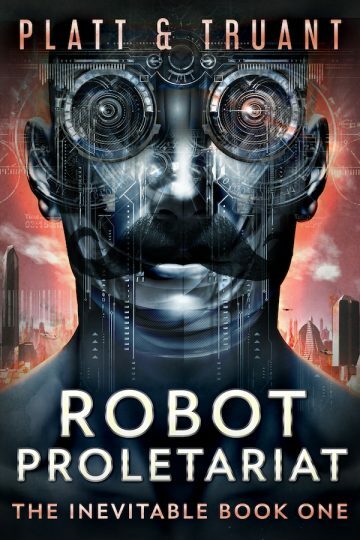 Robot Proletariat is the first book in the world of THE INEVITABLE— a unique take on dystopian science fiction which combines the spark of uprising and war with surprising insights into the human condition … through artificial eyes.